The Minoritenkirche in its very central location near the Hofburg looks ancient - and it is. The Minorites were Franciscan monks invited to Vienna by Duke Leopold VI in 1224. Leopold was a member of the Babenberg dynasty. When this dynasty became extinct, the Viennese merchants and burghers called in the King Ottokar of Bohemia in order to assure law and order. During this time, Ottokar laid the foundation for a new church, which became one of the first Gothic churches in Eastern Austria. The Viennese were very fond of Ottokar, but when he fought his rival Rudolf of Habsburg in the Marchfeld Plain, he died and the World′s most dogged dynasty took the rule of Austria - and kept it until 1918. 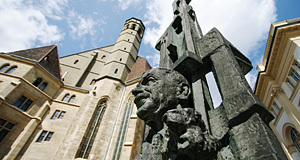 The dead body of Ottokar was displayed in the Minoritenkirche for 30 weeks. The early Habsburgs kept fiddling around with the Minoritenkirche, added this and that, all under a strong influence of French Gothic architecture. This went on throughout the 13th and 14th centuries and resulted in a church quite extraordinary for Austria, with a distinct dash of French to it. A tower was added, too, which is unusual for Minorite monks and indicates a prominent role of the church in the religious life of the early Habsburg court. The tower has a characteristic octagonal shape and no proper top - since the one it had was shot off during the Turkish Siege of 1529. In the following centuries, the church was almost not altered at all - apart from the odd piece of Baroque art which in inevitable in a country like Austria. In 1782, during the time when Emperor Joseph II dissolved all orders he considered "useless" (ie. not involved with medical care, schooling or simply too powerful for the Emperor). This included the Minorite monks, who fled to Wimpassing. The emperor then gave the church to the local Italian community - and this arrangement is still valid, as you can tell from the Italian flags, floral decorations and leaflets in the church. The Minoritenkirche was dedicated to Santa Maria Maggiore and even after the Minorites were allowed to return to Vienna a few decades later. Around this time, the church was also re-Gothed in the sense that Baroque interiors were removed. When Napoleon conquered Vienna, he ordered a mosaic copy of Leonardo da Vinci′s "Last Supper" in Milan. He had planned to hang it in the Belvedere Palace, but hadn′t expected two unfortunate things: His own defeat and the obvious lack of space in the palace for such an enormous piece of cra…ft. In the end, the Austrian Emperor Franz I bought the mosaic and put it into the Minoritenkirche, where you can still marvel at its marble. When a subway stop was built just outside the church, the construction site revealed the foundations of a chapel - which you can still see on the square, now neatly outlined. All around the Minoritenkirche you can find a nice array of representative "Palais" or city palaces. This is where top-notch nobility would have resided during their stays in Vienna, when they had to meet the emperor, make matches for their children or do other noble things that required their presence in the capital. The most important one is the "Ballhaus" which is now the official headquarter of the Austrian chancellor and his team. The Ballhaus (meaning "ball house") has a long history as a multi-purpose site for the nearby Hofburg palace. It has served as a sports venue, provisory Burgtheater, palace, and Prince Metternich′s headquarter during the Wiener Kongress in 1814. It is also where Chancellor Engelbert Dollfuß was shot by Nazi revolutionaries in 1934 - for details, go to the Heeresgeschichtliches Museum, where they got the blood stains to prove the story. Another Palais worth mentioning is set slightly off the Minoritenplatz Square: The Landhaus served as the provincial government to Lower Austria when this province did not have its own capital. Now that the Lower Austrian regional parliament messes around in St Pölten, the Landhaus shares one fate with the neighbouring buildings: They all serve as administrative buildings of some sort to various Austrian ministries and government offices.